Dudde paays or kumbalkayi payasa recipe - India celebrates 68th Independence day today. Each Indian enjoys the happiness of this day. This is the most memorable day for all of us. Wishing Each Indian A Very Happy and Joyful Independence Day. 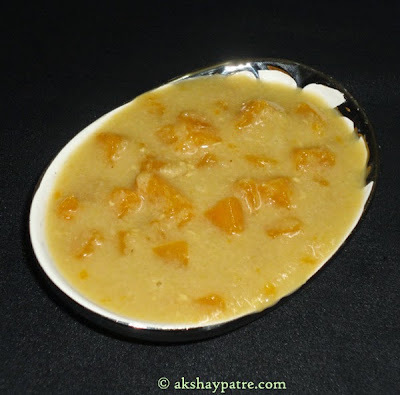 Today I made this pumpkin kheer to celebrate the special occasion of Independence day. Pumpkin kheer is a very popular South Indian traditional dessert. An ideal sweet dish to make on some occasions and festivals. Traditionally, pumpkin is cooked in thin coconut milk, simmered with thick coconut milk and jaggery, flavored with cardamoms and textured with semolina. Coconut milk and jaggery together release an excellent flavor when it is induced with cardamom powder. 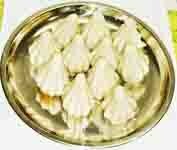 I have used semolina or rava in the kheer for my convenience, as I do not like to grind small quantity of rice. However, you can use rice instead of rava, for that, please read the note given below. I made this kheer using yellow colour round variety of pumpkin, which has luscious dense orange colour flesh as compared to the oval shaped pumpkin which has dang and thin flesh. 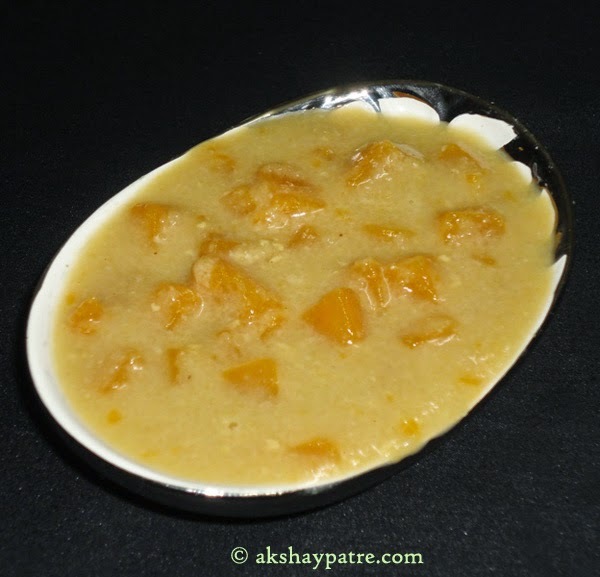 Whenever I bring the pumpkin form vegetable market, I reserve a small piece of it to make this delicious kheer as I am having a strong preference and liking for pumpkin kheer. It needs few ingredients and can be made quickly. 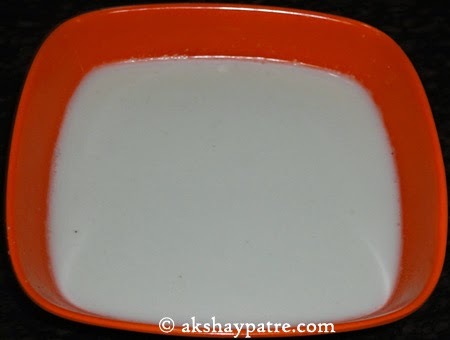 You can also make lauki or white gourd kheer in this way. Pumpkin takes a very few minutes to cook. Therefore take care not to cook it too mushy to avoid the kheer turns into paste. While cooking the pumpkins, you need to check it in regular intervals. It should not be too hard. That may spoil the taste of the kheer. For the best result, use hard and dense pumpkin that cut into evenly sized cubes. The time required for cooking the pumpkin may vary according to the size and quality of the pumpkin. Usually this kheer, is served with meal. Peel off the pumpkin skin, remove the seeds and wash it. Then cut it into equal sized cubes and set aside. Grind a cup of fresh coconut with 1 ½ cups water to a smooth paste. Strain it through a soup strainer and extract 1½ cup of thick coconut milk. Dissolve the jaggery in it and keep it aside. Again grind the strained coconut with 1 cup water and extract 1 cup of thin milk. Pour the thin coconut milk in a pan and keep it on medium flame. Add the pumpkin cubes and cook covered till the pumpkin becomes soft but not mushy. Then add the thick coconut milk with jaggery and bring it to boil. Add the rava or semolina. If you are using rice paste, add rice paste at this stage. Bring it to boil stirring continuously to prevent any lumps. Simmer for 2 minutes and remove from the flame. Add the cardamom powder, mix well. Serve warm or cold. Either way it tastes great. Garnish with dry cashews and pistachios if you like it. If you are making this kheer using rice paste, make sure to soak the rice 20 minutes before grinding it. Use 1 ½ tablespoons of raw rice in the place of rava. 1. Dissolve the jaggery in thick coconut milk and keep it aside. 3. 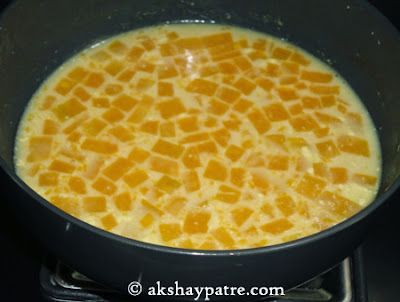 Pour the thin coconut milk in a pan, add pumpkin cubes and keep it on low flame. 4. Cook the pumpkins covered on low flame. 5. Cook until the pumpkins turn soft but not mushy. 6. Add the thick coconut milk with jaggery ( first piture) and bring it to boil. 7. 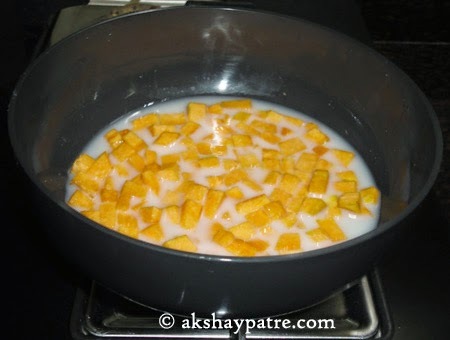 Add the rava or semolina and bring it to boil stirring continuously. If you are using rice paste, add it at this stage. Simmer for 2 minutes and remove from the flame. 8. Serve the pumpkin kheer warm or cold. Either way it tastes great. Garnish with cashews and pistachios if you like it. lip smacking and yummy kheer. Healthy and yemmy kumbala kai Payasa..